Patients who are missing teeth have a variety of tooth replacement options from which to choose, spanning the entire spectrum of restorative dentistry and oral surgery. At Piney Point Oral and Maxillofacial Surgery in Houston, Texas, Dr. Koo and Dr. Weil offer a comprehensive menu of restorative services that help patients reclaim their complete, healthy smiles and full function of their dentition, including osseointegrated dental implants. When a patient is missing one or more teeth, the bone tissue that comprises the jaw gradually begins to deteriorate over time. This is due to a lack of the essential support provided by the root of each tooth. Though dental prosthetics like fixed bridges and dentures do effectively replace the teeth that have been lost, they do not provide this necessary support because the root structure is still absent. Fortunately, dental implants offer an ideal solution to this problem, bolstering the bone tissue within the jaw and therefore decreasing the risk of further tooth loss. 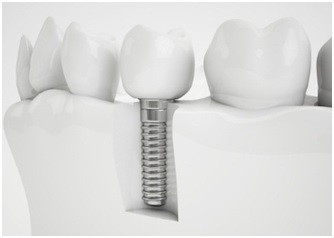 When a titanium dental implant is placed within the jaw, a natural healing process called osseointegration occurs. The biocompatible metal used to construct the implant fuses with the bone tissue in the jaw, creating a secure bond that serves as a new tooth “root.” This bond is often both mechanical and biological. The surface of the dental implant has been coated with a special coat that enhances biological bonding of bone that make the implant more studier than normal tooth often times. When the recovery period has been concluded, a one-of-a-kind, custom-crafted restoration is affixed to the titanium implant, thereby completing the lifelike restoration. Due to the process of osseointegration, dental implants are the preferred option for patients seeking realistic, long-lasting tooth replacement. At Piney Point Oral and Maxillofacial Surgery in Houston, Texas, Dr. Koo and Dr. Weil are committed to providing our patients with superior dental implant services and technology for exceptional oral health and wellness. Through the placement of osseointegrated dental implants, our team ensures that you retain a naturally beautiful smile while you enjoy the innumerable benefits of a complete set of teeth. We invite you to contact our office to schedule your one-on-one consultation today, or if you’d simply like to learn more about the benefits of osseointegration as it pertains to dental implant restorations. Our cutting-edge oral surgery practice serves patients from throughout the greater Houston area and surrounding communities, including Stafford, Galleria, Katy, Bellaire, Hunters Creek Village, and more.